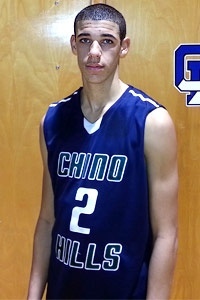 One of top 2016 Student Athletes in the country, Lonzo Ball of Chino Hills, (Calif.) has been showing out grabbing high major attention from college recruiters and media outlets. Mid Major Hoops Report has brought him to our “Players Corner” where we at MMHR are proud to highlight him and allow him to let us know why he chose UCLA over other top Colleges in the country…..
Lonzo Ball: The Season has been going okay. We feel we’ve lossed some very winnable games. Right now we’re good but we feel we could be great. Upto this point in your season, who has been your team’s toughest matchup? Lonzo Ball:We feel like we could matchup with anyone and should be undefeated. So I don’t know. Which college programs have been to your games and/or practices so far this season before you made your commitment? Congrats! On the commit to UCLA, what made you choose them over other big time colleges? Lonzo Ball:I wanted to stay home, I like the staff, and their style of play fits my game. Which College Athlete or Professional player, do you compare your game to? Lonzo Ball:Well I try not to just patent my game off of one player. I like to take a little something from everybody. But, if I had to pick one it would probably be LeBron James because he can do it all. Any big time camps or showcases you plan on attending after this season? What AAU team are you associated with? Lonzo Ball:Everyday. No Days off.